Pass the fillets through the seasoned flour , shallow fry in butter for 1 minute on each side and save on kitchen paper. Simmer the chopped fennel together with orange zest in the olive oil until tender. Add 2 tablespoons of white wine, arrange the fish fillets in the pan, add the sliced oranges and sprinkle the chopped mint on top. Cover and simmer for 3 minutes. 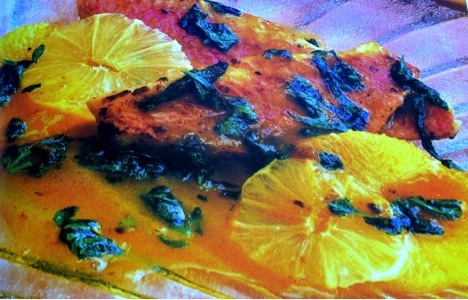 Did you enjoy reading this recipe of red mullet fillets with orange, fennels and fresh herbs? Let us know what you think by rating and commenting on this post below and share so that we can continue to bring you the content that you love.